It’s What’s On Your Work Desk Wednesday again and firstly, let me thank everyone for the kind comments and encouragement you left last week on my ‘Land of Blah‘ blog post. You’ll be pleased to know that Mrs Blah has now left the building and my muse is back. Hoorah!
. 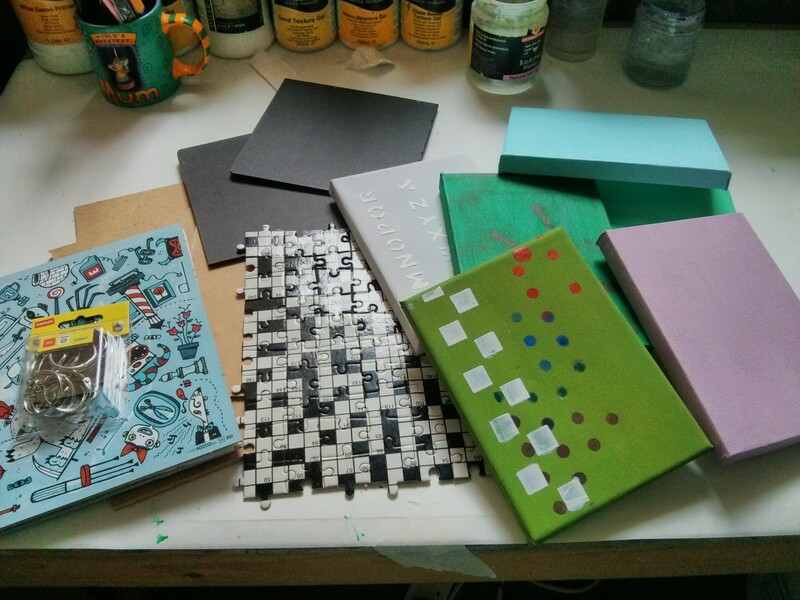 . . my in progress art journal whose covers are upcycled from an old board game, some canvases in the first stages of being turned into more inspirational mini art with quotes and some hardboard and an upcycled jigsaw which I’m going to use with the winner of my first ‘Vote For A Quote‘ poll. Oh yes, and I’ve cleaned my desk. I shall risk the temptation to ramble on about the stories behind these things as I shall no doubt be telling them when the items are completed and would rather not repeat myself. But, feel free, to sign up for updates (top right hand corner) so you don’t miss the tales of non arriving Zutter Bind-It-Alls, how masking tape saves the day and how I’ve finally found a use for my hoards of QSL cards. This looks like fun! Happy WOYWW! What’s going on..cleaning up, getting ready..huh, anyone would think you were trying to show some of us up!! I really like the crossword puzzle jigsaw..specially your plans for it. Glad you are feeling better and love those canvas’s, weather is a little cooler so that should be helping. Love the jigsaw like a crossword puzzle. Great colours making your desk look really full of fun. Can’t wait to see what you do with the old game/jigsaw boards! Glad you are feeling better. Have a good WOYWW week!